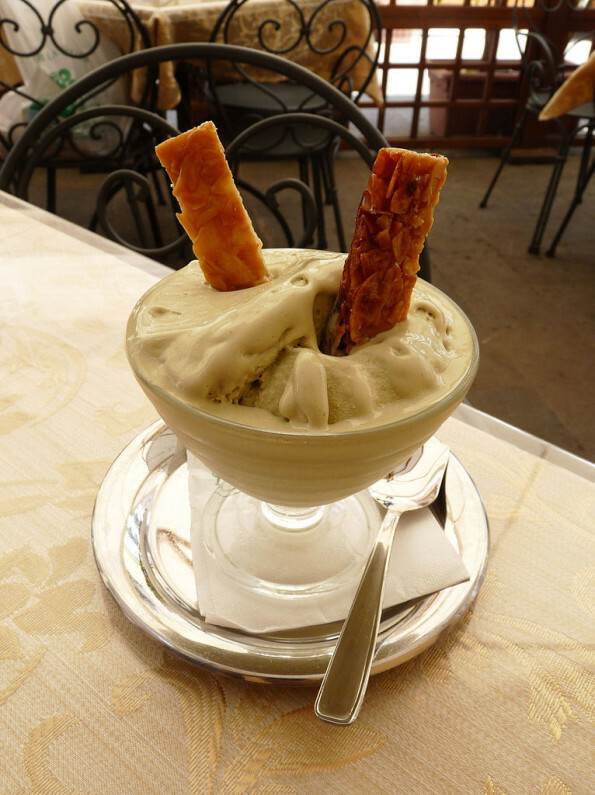 Distinctively light green in color, Pistachio is an immensely popular flavour of ice cream. It supposedly originated in the Arab world and gained popularity all over the world. Almost every leading ice cream brand has a pistachio ice cream flavor in their menu and it is in fact, quite easy to make this delicious ice cream at home. Add ¾ pistachios in a grinder‘s jar and grind coarsely. Pour milk in a saucepan and put it over medium heat. Add the ground pistachios to it and bring to a boil. Then reduce the heat. Add in sugar and simmer for 3 – 4 minutes while stirring occasionally or until the sugar is well dissolved. Remove from heat and add the almond extract. Stir and let the mixture cool to room temperature. Whip the cream until soft peaks start to form. Now fold the prepared custard and pistachio milk into the whipped cream. Stir and transfer into refrigerator to chill for an hour. Pour the chilled mixture into your ice cream maker and freeze according to manufacturer’s instructions. Tip: You may use also freeze this ice cream in your freezer directly; just churn it once or twice every 2 hours with a fork to break ice crystal formation. Chop the remaining pistachios and add into freezing mixture when it is almost 80% done. Transfer frozen ice cream into tin or plastic container and put in freezer to set it nicely. Transfer the tin from freezer to lower compartment of refrigerator at least 15 minutes before time to serve so as to soften it a bit. When serving scoop out generous portions of the ice cream into dessert glasses and arrange wafers of choice decoratively.